I just finished reading Mary Higgins Clark's memoir "Kitchen Privileges" and I almost felt ashamed to be whining about my "issues" in my (writer's) life. Yes, I have issues, but not like she did. She does not whine or beg for anyone’s pity, ever. She writes about her losses in such an understated way. I think that is her trademark, why she is so successful. She was once told that her writing was “Light, slight and trite”. I think it’s because she writes in an understated way and if you aren’t paying attention it’s easy to miss her depth. Try her short stories sometime. Think she’s a “safe” writer? Not in some of her short stories! I think when you live through what she has you end up hiding a part of yourself, maybe even from yourself, to survive. Because you fear that if you really thought about how bad things are you wouldn’t make it. Maybe those short stories she wrote, the ones that aren’t her typical, that are tough, hard, and sad with no happy endings, show a part of her that she had to hide. The part of her that was afraid, the part of her that gave in to the blackness at the bottom of the pit. I’m reading between the lines here, but I have a hard time believing anyone could go through so much loss and not have darkness somewhere inside. From this memoir I get the impression her family and her writing gave her a way to the light. I am inspired by MHC’s determination, her never seeming to let life take her to rock bottom. Life must have taken her down, quite a few times, but she proved her resilience by continuing on, by raising five children without a husband by her side. Her mother was her source of courage I’m sure, and was a huge help in making her life possible after her husband’s death. I take heart from memoirs like hers and will try to apply that hope to my own struggles, internal though they may be in comparison to what she, and others throughout time, have gone through physically to pull through. Makes me wonder if your success is only as large as the pit you had to crawl out of was deep. I hope not. I have been blessed not to have lived through the same challenges she did. My challenges are my own. Who is to say if one produces more “success” than the other? Only time. Only time, and effort, will answer that one. So, I will keep on trying. 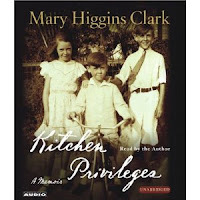 Thank you, Mary Higgins Clark, for sharing your “story” with us, your fans. You are a living inspiration.